Scotch Bright Pads are made of a non-woven nylon abrasive material that assures the best finish for all surface preparations. Each pad measures 6" x 9" x 1/4". These pads are flexible, making them form fitting, rustproof, non-loading and can be used dry or wet. The general grade is equivalent to #1 steel wool, fine grade is the same as #00, ultra fine equals 000, and the finest is equal to #0000. The Assort. 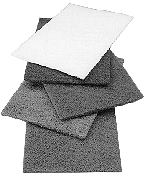 pack contains 5 pads of each abrasive grade.